When you ask a beauty professional why they love their careers, you’ll likely get many different answers. One of the most common answers we hear is that cosmetologists, estheticians, barbers, and other beauty professionals have a deep and abiding love for helping other people. Whether that means reaching out through a service event or simply providing an outstanding haircut, we like to help other people be happy. 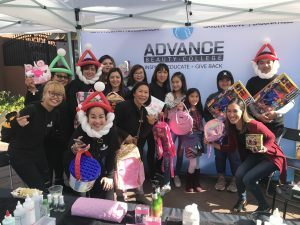 On December 2nd, 2018, Advance Beauty College expanded the ways that it makes a difference by partnering with OC Drive to help with their annual toy drive for the holidays. The Winter Toy Drive by OC Drive has become a huge annual event that has positively impacted the lives of thousands of children in Orange County! OC Drive is a non-profit organization that was founded in 2016 by Jayce Yenson, Gary Nguyen, and Sonny Nguyen. The founders saw the good fortune in their own lives, and saw an opportunity to teach their children compassion and responsibility for others. They recognized an opportunity to provide for others in the community who are less fortunate, so they held their first Winter Toy Drive. They saw this event as a “vehicle” through which people could show kindness and generosity. They did it for “our children” and “our cause,” which is where the OC Drive name comes from. The first Winter Toy Drive was held in a vacant parking lot in Huntington Beach in 2016. An exotic car was brought as an entertainment centerpiece for passersby to enjoy, and the event successfully collected a few hundred toys that were distributed to local children’s organizations. The success of this first event caught the attention of the mayor of Garden Grove, Steven Jones, and he insisted that the 2017 Winter Toy Drive be held on main street in his city! That year the event collected more than 1,500 toys, and the Winter Toy Drive was cemented as an annual event for the entire surrounding community. OC Drive works with other local businesses and members of the community to make sure that the annual Winter Toy Drive is a success. 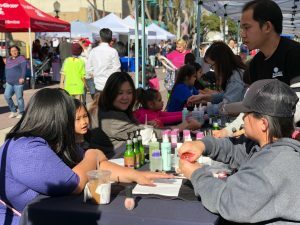 This year OC Drive partnered with organizations such as 7 Leaves Cafe, 24/7 Care at Home, Saigon City Marketplace, and Advance Beauty College to help make the event happen. Advance Beauty College participated by setting up a booth to perform nail polish and glitter tattoo services. Contributions like these helped to attract more visitors who were able to donate and help provide toys for children in need throughout the community! This event was beneficial for the children that received the gifts, but also for the children who had the chance to learn compassion and kindness through donation. Helping to collect toys for children in need is just one way that Advance Beauty College strives to be involved and help the community. Beauty professionals have the opportunity to help other people every day through the services they provide, which is why so many of them love their careers. Are you interested in making a difference? Contact us to learn about our programs that can help you to become a beauty professional that changes lives!